WOODLAKE – The Tigers capped off their 2019 campaign by hosting the East Sequoia League Championships on Friday, Feb. 1. The home mats must have had some good luck as the Tigers had nine wrestlers place en route to their third-place finish. Woodlake had two wrestlers win their respected classes. The biggest was Elijah Moraido winning the 113-pound weight class and inciting some revenge over Granite Hills’ Victor Castillo. Two days before the league championships the two wrestlers had met in a dual match. Castillo got the best of Moraido with a pin. On Friday, Moraido did not let the thoughts of the recent past enter his mind. He ended his four-year career with a win over Castillo, and finally won the individual league title which had eluded him. 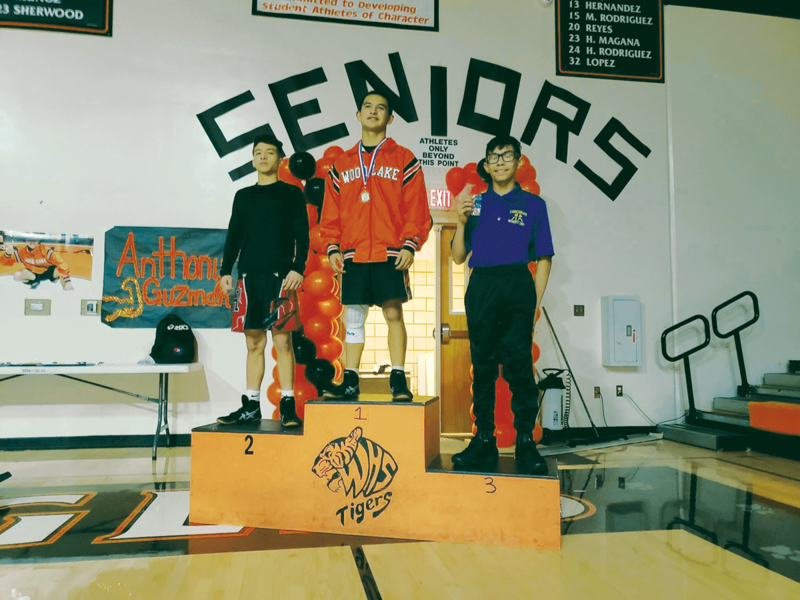 Anthony Guzman, another seasoned wrestler for Woodlake, in the 195-pound weight class was the Tigers’ only other league champion. He was victorious over Arturo Mendoza of Granite Hills. The success was not only reserved for the seasoned wrestlers however, as three first year competitors; Agustin Nunez in the 152-pound weight class, Fernando Salazar in the 220-weight class, and Fabian Murillo in the 285-weight class, earned spots on the podium. “For all three to come through strong and finish on the podium is impressive,” Ramirez said. Woodlake had two second place finishers in Isaiah Nicolas in the 106-weight class, and Brandon Renteria in the 182-weight class while Jayden Gamez took third in the 120 pounders. Aaron Moraido wrestled in the 126 pounders and took fourth. Regardless of how the wrestlers finished all will now head to the Division V Valley Championships this weekend, Feb. 9–10, in East Bakersfield.